Turner Sports, which manages the digital platforms for the PGA, views every high-profile event as a chance to make the online experience even bigger. For the PGA Championship at Bellerive Country Club in St. Louis this week, viewers both at home and on the course will have all the golf they can handle. The event’s full package of digital experiences goes by the brand name PGA Championship Live and offers multiple HD live video streams, interactive elements including a Top 5 leaderboard, and minute-by-minute live reporting of all the action from around the course. App users can learn about the design elements that make distinguish each hole on the course. They can also watch dedicated coverage of Holes 16, 17, and 18 to focus on the event’s most crucial moments. PGA Championship Live will follow four featured groups a day, starting at the driving range as the players take their first swings. As in previous years, online channels will complement the broadcast feed by following featured groups, giving nonstop 4½-hour looks at favorite players. That’s something TV can’t do. But, this time, Turner Sports is expanding that featured-group video by starting it from the driving range as the pros take their first swings. Turner will follow four featured groups each day: two in the morning and two in the afternoon. 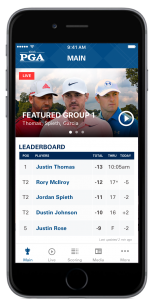 Authenticated pay-TV customers can watch broadcast feeds through PGA Championship platforms, the Watch TNT app, and pay-TV–provider apps. Fans interested in Featured Groups and Featured Holes video can watch for free from B/R Live on a mobile browser or iOS, Android, Roku, or Amazon Fire TV apps. Because this is the PGA Championship’s 100th anniversary, Turner Sports has implemented some special features. One of those is an “ultimate bracket challenge,” where fans can watch videos of tournament highlights and vote for their favorites. Round-one voting continues through Aug. 8, Rounds 2-4 through Aug. 11, and fans are allowed to vote on each head-to-head once per day. The fan-selected winning moment will be announced Aug. 12. Fans that don’t have time for a long viewing session can catch the highlights, thanks to Turner’s video-distribution system. The best moments from each day will be clipped and posted across the PGA’s digital platforms, available through websites, apps, and social channels. Clips are optimized for each platform. Turner is also offering live coverage through Facebook and Twitter, beginning days before the championship begins, covering all the sights and sounds from the practice rounds. Anyone who remembers the Mani Cam that E! launched at Hollywood red-carpet events will get a laugh from the PGA’s Kick Cam. In a fun online offering, the Kick Cam focuses on the player’s shoes. Although most golf fanatics watch the action on TV or online, Turner Sports never neglects the on-course fans. For the PGA Championship, it’s bringing back Golf Mode, an app feature that ensures that fans’ phones are quiet on the links. It’s also bringing back the Player Locator. Turner is also creating a video offering for onsite fans at the driving range. Fans can watch a large video screen that models the players’ swings, showing the path of the ball in flight and providing angular data. Through constant iteration, Turner Sports and the PGA have found ways to use video and other technology that make major events more fun and interesting. This year, it will live-stream more than 100 hours of golf over the event’s four days.